Jaguar Classic Red is created for those who love adrenaline, adventure & excitement. 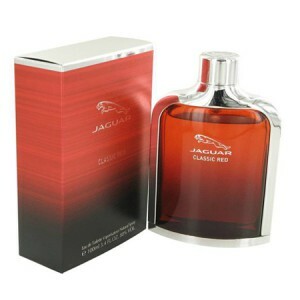 Jaguar Classic Red 100ml. Eau De Toilette is the perfect fragrance for modern men who love living life to the fullest. Introduced by jaguar in 2013, this invigorating cologne harmoniously blends creamy, spicy, fruity, and floral tones and is sure to draw attention. Its top notes include blueberry and raspberry, which give it a natural sweetness that's not too overbearing. The middle and bottom notes include tonka, pepper, and cedar, creating an overall fragrance that's masculine, sensual, and designed to make any man feel more confident. Incredible masculine fragrance Jaguar Classic Red perfect complement to the modern look of a man who lives in the basic emotions. The aroma Classic Red presents an unusual combination of bergamot, sweet blueberries and raspberries, changing to a cocktail of jasmine, ozone, and Pepper, which imparts a special taste of power and reliability. Trail of patchouli and cedar, complete with amber, vanilla and tonka beans if imbued with harmony and chic long accompanies its owner, highlighting its best features.